The Art of Racing in the Rain by Garth Stein is next up on our 100 Bestsellers List reading challenge. This novel is categorized as Literary Fiction. Such a simple concept, yet so true: that which we manifest is before us; we are the creators of our own destiny. Be it through intention or ignorance, our successes and our failures have been brought on by none other than ourselves. Roberta stated in her Writer’s Review that she felt manipulated by the string of bad luck that Denny endured. Was it all bad luck, though? When Eve became ill, it seemed logical to Denny that Eve and Zoe should with Eve’s parents. Eve’s parents had more money to provide care, more space for hospital beds and such, and they were retired, so they had the time to devote. How would Denny cope with illness and hospital beds and Zoe’s care and still be able to work? And yet he was setting himself up for long-term heartache and legal troubles. We are the creators of our own destiny. Be it through intention or ignorance, our successes and our failures have been brought on by none other than ourselves. Throughout Eve’s illness and then the subsequent custody battle, Enzo does his best to provide Denny with moral support and companionship. In one memorable scene near the end of the novel, Enzo is able to change Denny’s mind when Denny has decided to give up on the custody battle, and the way he does so makes his message impossible for Denny to misunderstand. I first read this book in 2012 and enjoyed it thoroughly then. Five years later, I found it to be just as enjoyable. Enzo does his best to provide Denny with moral support and companionship. In one memorable scene, Enzo is actually able to change Denny’s mind when Denny has decided to give up on the custody battle. In the last chapter, we discover whether Enzo was successful in his desire to be reincarnated as a human, and more specifically, a race car driver. Was he ready? I hoped all along that he was. Have you written about The Art of Racing in the Rain by Garth Stein? Feel free to add a link to your review in the comments. Let’s take a look at The Art of Racing in the Rain by Garth Stein from a writer’s perspective. The discussion began here. Literary fiction rarely unfolds in strict chronological order. In this case most of the story is an extended flashback as the narrator remembers his life. The very last section flashes forward into the future, which is a bit of a stretch because he is no longer available to tell the story. The story is told in the first person from a dog’s point of view. The narrator is Enzo, a lab-terrier mix, who lives with race car driver Denny Swift, Denny’s wife Eve, and daughter Zoë. Having a dog for a narrator has advantages and disadvantages. On the plus side, the author doesn’t have to delve as deeply into his human characters. For example, if Denny was the narrator the reader might expect to sit in the car as he races around the track. Because he isn’t the narrator, the reader gets the TV-viewing dog’s analysis of events instead. Ability to travel is restricted. Enzo can’t go to the trial with Denny, for example. The dialogue is tricky because the dog doesn’t speak. Enzo can only report dialogue he overhears. The dog has physical limitations, like having no thumbs and having limited color vision. The author must keep track of all these differences to realistically limit his character. It also leads Enzo to be a bit unreliable because he can only guess what is going on from his narrow observations and memories. 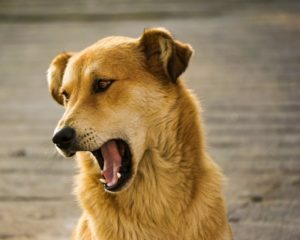 The story is set in Seattle, but we don’t get a strong feeling of setting because of the limitations of a dog narrator. It might have been informative if the author had described what Seattle smells and sounds like from a dog’s perspective. As a work of literary fiction, The Art of Racing in the Rain has deeper themes and symbolism than a genre fiction title might have. One of the symbols is the toy zebra who runs amok in a surrealistic scene. He symbolizes what can go wrong in life, and possibly helps with foreshadowing. There is a strong theme of death and dying, and both Eve and Enzo die before the end of the book. There is an emphasis on Enzo’s idea of reincarnation and that death is a step towards becoming human. On the other hand, it is also about love and relationships, particularly the unbreakable bonds between Denny and Enzo, Denny and his wife Eve, and Denny and his daughter Zoë. Because Enzo could only report what he witnessed, it had the effect of distancing the reader from emotional lives of the human characters. Some readers don’t find that troubling and report crying in all the appropriate tissue-wringing spots. Other readers see the gap between dog’s reporting and what the people are feeling as too artificial. In fact, the author may have added the long stretch of tear-inducing bad luck to counteract the emotional insulation of having a dog narrator. I think we’ve all known people who’ve had more than their share of misfortunes, such as multiple deaths in their families, economic troubles, etc. That said, the string of bad luck Denny endures seemed unbelievable at best and blatant manipulation of the reader’s feelings at the worst. This isn’t the first time I’ve felt manipulated by literary fiction (see my discussion of Olive Kitteridge, for example), which may be why I don’t enjoy it as much. 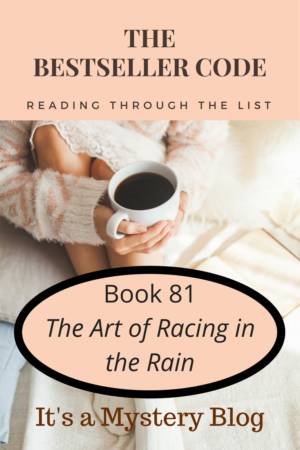 Have you read The Art of Racing in the Rain by Garth Stein? We’d love to hear your thoughts. Time to start the discussion of our next novel from The Bestseller Code 100 list, The Art of Racing in the Rain by Garth Stein. Summary: Told from the first person (dog) point of view of Enzo, a lab-terrier mix who lives with race car driver Denny Swift. Today we’re looking forward to starting the next book in The Bestseller Code 100 challenge, The Art of Racing in the Rain by Garth Stein for Book Beginnings on Fridays. What: Told from the first person (dog) point of view of Enzo, a lab-terrier mix who lives with race car driver Denny Swift. Gestures are all that I have; sometimes they must be grand in nature…And that is why I’m here now waiting for Denny to come home — he should be here soon — lying on the cool tiles of the kitchen floor in a puddle of my own urine. I have to admit when I read this book was written from a dog’s point of view, I was a bit concerned. Without a doubt, I envisioned something “cutesie.” The tone of the first paragraph isn’t at all what I expected. Would you have guessed the narrator was a dog except for the “puddle of urine” clue? I’m looking forward to reading it now. What do you think? Would you read a book told from a dog’s perspective?